As the Royal Garden Palace begins to fall apart, Hayate gives up and allows himself to enjoy the dream world. As such, he enjoys the Christmas party with Ayumu. As they walk home after the party, Hayate realizes he doesn’t have a place to stay. Ayumu invites him to stay at her home. Hayate then confesses his love to Ayumu, telling her she saved his life. Ayumu doesn’t feel satisfied with how things are going, realizing this isn’t the Hayate she fell in love with. As such, she turns him down, gives him words of encouragement, then kisses him before leaving. Hayate wakes up in the Royal Palace. Sakuya is able to communicate with him and tell him the urgency of the situation. Hisui attacks, showing her insanity at not caring about her own life. Isumi arrives to battle Hisui, allowing Hayate to go rescue Nagi and the Royal Power. Hayate races away and through a door, where he finds himself at the mansion with Maria there. He realizes this is Nagi’s dream world. Man, I do apologize for the extreme delay in getting a review for this chapter. It has ended in Japan, and yeah, I know the ending. It doesn’t change my opinion of this chapter because I never once doubted the ending, even if it is forced. We conclude the “what might have been” story for Ayumu and Hayate in chapter 565. I’ve no doubt Hata-sensei meant this as an olive branch of sorts to Ayumu shippers as well as to folks who think Ayumu is always getting screwed. For me, it was like rubbing salt in the wound. I’m not talking about Hayate ending up with Nagi. I’m talking about the way the manga is ending in general. I’ll refrain from saying more on that until my final thoughts, but I just feel a lot of anger because of how much time this manga wasted. That said, I appreciate Ayumu’s honest self inspection and not settling for the gentle lie of this fantasy. However, as with Athena, Hata-sensei has Ayumu torpedo herself again just to clear the field. So it adds insult to injury for her to let everything go with a “This year wasn’t a mistake” and a kiss. Thus the indecisive Hayate gets off the hook. 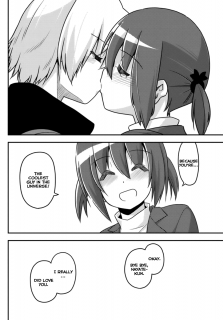 I know some will disagree with me, but Hata-sensei did such a poor job of establishing the Nagi x Hayate end other than, “Hayate lives with Nagi, Nagi has unrequited love for Hayate, Hayate takes care of his mistress and cares for her without romantically loving her, however he has to be with her until the end of time ’cause that’s how I originally envisioned them.” I’ve no doubt that Hata-sensei knows he didn’t do this plot thread properly. I think he’s admitting this via Ayumu’s and Hayate’s dream world. When Ayumu says that she messed up the starting point, Hata-sensei did the same in Hayate the Combat Butler. In the prototype manga, it is clear from that Hayate and Nagi are to be together romantically. Indeed, it wasn’t until I read the prototype manga that I realized that Hata-sensei really did always intend for there to be a Nagi x Hayate ending. In the prototype manga, getting Hayate to be Nagi’s butler is more of a stretch. While Hata-sensei fixed that in the canon version of the manga, he lost the Hayate x Nagi elements that were in the prototype. Hata-sensei attempts to explain his plan for Hayate and Nagi being a couple via Ayumu’s and Hayate’s dream world. Hayate thanks his savior (Ayumu) and professes his love for her because of what she did for him. Of course the difference here is that since Hayate and Ayumu were already friends, Hayate’s confession comes off believable. That element does not exist in the reality when Nagi misunderstood Hayate and took him in. She fell in love with Hayate, but he didn’t love her. He cared about her greatly, and that’s made clear throughout the manga. Yet he never had feelings for her in a romantic sense as he did for Athena or even Ayumu here. 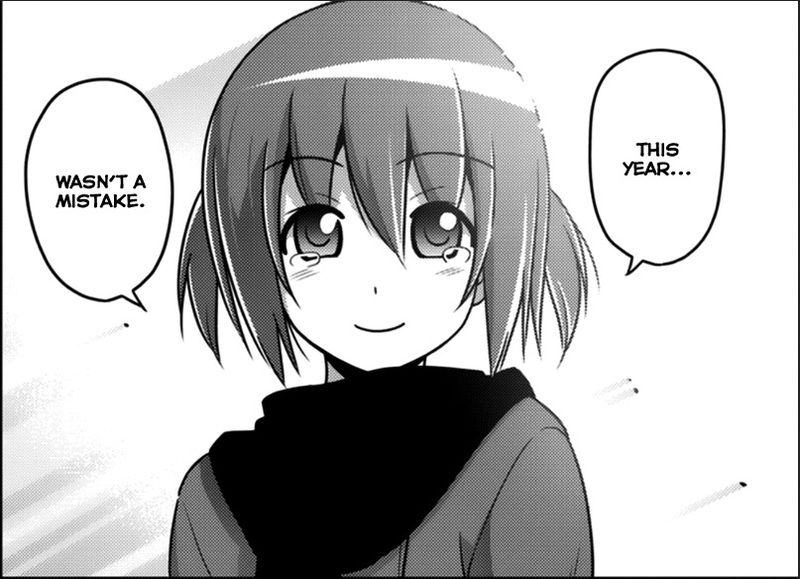 However, Hata-sensei had intended for Hayate to fall in love with Nagi, but over the course of this “year” in the story, that hasn’t happened. That’s because Hata-sensei messed up at the start. Unlike how he treated Ayumu and had her bow out to reality, Hata-sensei isn’t giving up. He’s going to have the ending he always intended and though it hasn’t been established, he wants us readers to know that his original plan was to properly establish it, but it didn’t go the way he planned. I need to get this published, so here’s a wrap up of Hayate the Combat Butler chapter 565. It is a shame Hisui didn’t get any proper character development. By the time she was introduced, there was no time to do anything other than some minor character development and then turn her into a one dimensional, insane villain. It is a shame there’s no time to see Isumi get revenge on Hisui. I guess Maria showing up is supposed to be a nod/troll from Hata-sensei to fans who figured she would be the final boss. I know she’s in the next chapter, but it is a shame there was no time to do her story. In the end, Hayate the Combat Butler chapter 565 angered me, mainly because all I could think about is how much time Hata-sensei wasted thinking he had to do pointless months of gag chapters and ignore the plot of the story. Hey… why are you still reading this manga? ‘Cause there are only three chapters left. 😉 So may as well read it until the end. Yep. Twitter too. Links are all on the main page, but here’s the Facebook entry. Well..I’m at Facebook too but I wanted to chat with you there…..If you don’t mind…..Send me your profile link…If you want…. Gag manga as a crutch. Yeah, I kinda think Hata-sensei did this.